With an MA in Art History and Theory, Călin combines research, writing and artistic production in projects unifying social concerns with aspects of entertainment and (pop) culture. A veteran of b/w photography, Călin reached international acclaim with his photographs and videos from the series Emotional Architecture, which explore the delicate in-balance between people and habitat, as well as the ways how they both interact with political and economic forces. Călin’s work has been showcased in international film festivals, art biennales, group and solo shows in art museums, and galleries throughout Europe, the USA and Australia. 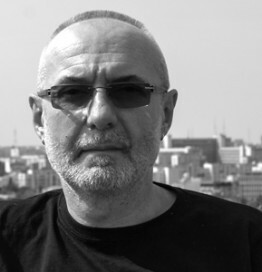 As of July 2014, he has been appointed General Director of the National Museum of Contemporary Art (MNAC), Bucharest. Künstlerhaus Bethanien, Berlin, 1995; Akademie Schloss Solitude, Stuttgart, 1997; IASPIS – Stockholm, 2002; Edith Russ Site for Media Art, Oldenburg, 2004; Monash University, Faculty of Art & Design, Melbourne, 2009. Media prize of the Split Film festival, 2000 ; Prize of Videonale Bonn, 2001. Neuer Berliner Kunstverein (NBK), Berlin; Moderna Galerija, Ljubljiana; National Museum of Contemporary Art (MNAC), Bucharest; KIT – Art Academy, Trondheim, Hypo Bank, Frankfurt, Mairie de Paris; Fondazione Cassa di Risparmio, Modena, various private collections.